Package Quantity:1 | Style Name:Brown Ready to ditch the old PVC plasticcutting boards consistently leaching into food? Looking for a health andenvironmentally sound solution suited to big carving jobs like barbecue meator Thanksgiving turkey? 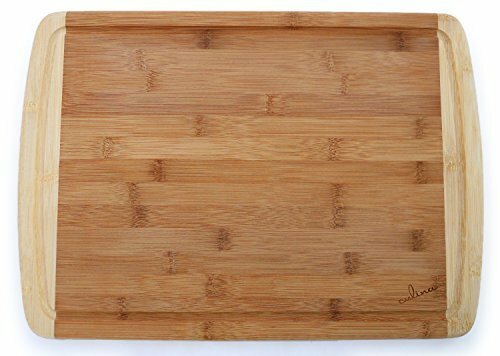 Culina Bamboo Cutting Board with Carved Drain is 1"thick for unparalleled performance, utilitarian use. Bamboo's excellence:nature-awareness and great performance Throw away harmful plastic boards,forget switching to a traditional (lumber-made) wooden board as it causes harmto the environment. Bamboo is a prime, innovative and sustainable resourcegrown with the knowledge that it quickly regenerates; a great contribution toour Earth at a time of severe deforestation. Bamboo absorbs less liquid thanits lumber counterpart which means it doesn't trap bacteria which washes awaywith soapy water and thorough rinse. The fine sanding gives this medium brown,two-toned board an impeccable finish and just the right touch of rustic toyour decor Robust, durable, convenient: gets the job done. With close to 18"length work surface, it is suited to large size meat, poultry, fish and gearedtowards utilitarian use at professional level or at home Food grade bamboomaterial makes handling a variety of ingredients fast, easy and convenient:not just meat but also produce, bread, cheese and more. Knife-friendly: Noblade dulling. Bamboo wood doesn't scratch or dent easily either; chop, cut,slice, dice, hash without a worry. 1" wood thickness is too dense to causecracks where bacteria could breed. The 18"x12" board can double as anattractive party presentation platter (cheese, nuts, BBQ, whole fish.) Carvedgrove is great for easy, convenient draining of water excess Wash with soapywater and let the cutting board air dry. Excellent idea for a housewarming orwedding gift.